there’s something hilarious about how in the break room on this floor (and i assume every floor) there’s a wall of shelves and they’re all filled with stacks of paramount-branded paper cups. surely this money could’ve been put to better use. posted on my tumblelog – what i’ve seen, what i need to see. oh. my. god. is the best part the kicking? or the drunken stumbling? i can’t decide. The images presented on this website are from a set of two World War One sketchbooks archived in the University of Victoria’s Special Collections Library. They contain approximately 130 water-colour and pen and ink images which were produced by a British soldier based in France and Belgium between 1917 and 1918. …or at least until 3am. we started out, just will, cameron and i, with bohnanza and 6 nimmt!, both german card games – both a lot of fun. we moved on to elvenland when jack and pat arrived. then we played puerto rico (which took hours) and tikal. hopefully this becomes a regular thing. music! bcam! la brea! art! film! board games! friday night i met up with my practice group at citizen smith for dinner (went to pat’s first to check out the new bar asa bought – it’s fantastic) then we all went across the street to hotel cafe to see ankur’s band, seneca hawk. they were really good and i stuck around to see the band after them too, the evening episode, who are really worth checking out too. saturday meghan, josh and i met up at pat’s place so josh and pat could transfer the beer the boys are making into the secondary fermentation tank. we went to doughboys for lunch (i had the beefy mac and cheese and it was sooooo good). we had reserved tickets for the opening of the new broad contemporary art museum at the LA county museum of art and the place was crazy. this is the free community weekend so there are all kinds of activities – magicians and stilt-walkers and other performers. the museum was really cool – there’s a giant glass elevator in the middle that makes you feel like you’re an exhibit – and the collection was pretty impressive. after bcam we went to the la brea tar pits and it was SO COOL. the museum was great – lots of skeletons! and pat pointed out that the page museum itself totally looks like the raptor enclosure in ‘jurassic park’. the museum is mostly underground – you walk up a big hill and the museum is embedded in the top, so all you can see from the outside is the very tops of the trees that are in the big sunken courtyard. after we saw the museum we went to the observation room over pit 91 where the current excavation is underway. you can see bones sticking out of the asphalt and everything! meghan and josh had to head home to check on watson, and pat and i drove to the culver city art district. we saw a photography exhibit (very dark and disturbing – awesome) and a cool blown-glass exhibit. there is an amazing exhibit going on at project: gallery right now – tessar lo and chris devera. tessar lo is so good and also a bit unfortunate to have a very similar style to james jean (who is one of my all-time favorite illustrators – see ‘fables’ and ‘the umbrella academy’ covers). he just graduated and already has a fully developed style but it’s so similar to james jean’s he’s having a hard time getting out from his shadow. anyway, thinking of james jean reminded pat that the owner of project:gallery had told him there was a james jean mural up at the beverly hills prada store, so we drove up there to check it out. it. was. amazing. we ended up talking to one of the associates at prada for a bit about the mural (which you can see on james jean’s website under ‘work’) then we took a look at the clothes that have his illustrations on them. see prada.com for the clothes, the mural in situ, and click on ‘trembled blossoms’ for the animation based on the illustrations. after all of the cultural enrichment pat and i were exhausted so we took a two hour nap before getting some awesome thai food and having an impromptu party with some of asa’s friends before they went to another party. then i watched ‘casablanca’ for the first time and oh my god, that movie is incredible. after ‘casablanca’ pat and i wanted to watch something else WWII-related, so we put in band of brothers. we ended up watching 3 or 4 episodes and staying up till 5.
today i’m going over to will’s for a whole afternoon/evening/night of board games and i am SO EXCITED. some carcassonne, some settlers of catan, other games i’ve never even heard of – it should be fantastic! meghan & josh’s official wedding photos! she played it for the first time today at my cousins’ house. also, at the end of the song she pretended to smash the guitar over my 7-year-old cousin’s head. god i love this woman. today while the boys were brewing beer, meghan and i went down to venice and walked around abbot kinney. we ate at jin patisserie which is meghan’s favorite – they have great teas, cakes and delicious quiche. we visited just about every boutique on the street and checked out the bookstore and the organic herbal remedy shop (no i don’t have a prescription for medical marijuana, but thanks anyway?). i got a cute little cactus and a jade green pashmina and meghan got some extra cakes at jin for josh. considering all of the cute clothes, jewelry and that awesome paperie, i think we showed some pretty remarkable restraint. i watched cnn all of yesterday evening, then pat and i went to big wangs after the gallery 1988 opening, just in time to see (although not hear) obama’s speech. numbers are still being tallied and each democratic camp is claiming the delegate win – i never thought i’d be this excited about an election! i looked at my bank statement today, and all of my debit expenditures were for food, gas…and comics. how much could a person possibly spend on comics you might ask? oh, about $230. $230!!! HOLY CRAP SOMEONE STOP ME. pat: would you be up for that? addendum: now i’m really hungry. 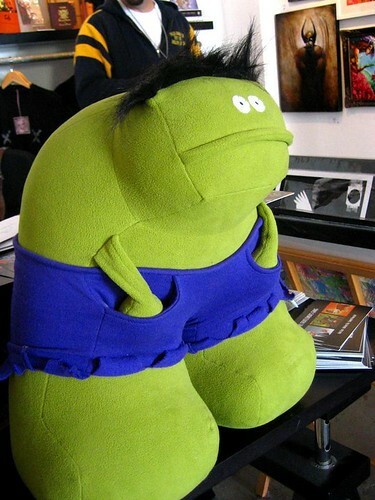 new photos posted including this one of a stuffed hulk i saw at the gallery 1988 “tribute to stan lee” show last week. i love him. ie: Monday night I totally got punched in the throat.